Which Voodoo Faceting Polishing is Right for You? It is important to understand that finer diamond particle size does NOT always mean a finer finish. At larger diamond particle sizes, the diamond plows through the softer stone being cut, scratching a furrow and removing material in an abrading process. However, at smaller diamond particle sizes, the scratches stop scraping material off the gem, and begin instead to shove it out of the way in a ductile manipulation process. Ductile manipulation induces strain in the very thin layer being operated upon. That strain may invite microscopic cracks or may make the surface more vulnerable to tiny scratches, which can relieve the strain a bit. This is why some materials (or individual facets of individual gems) may show a cleaner sharper finish when polished by larger-particle-sized diamond polish than when polished with smaller-particle-sized polish – and why they may appear nicer yet when polished with Oxide polish. This kind of behavior is most obvious in Quartz, but may be noticed in other materials as well. If you want to create the best polish, experiment by polishing every other facet with one polish and then finishing the others on a different one, and compare them under a loupe. In my experience, many materials will polish more nicely (as well as more quickly) with 14k diamond than with 50k or 100k. In my work, I will usually test the larger diamond first and work my way down to a finer grade if necessary. Diamond-based Voodoo polishes will work on almost any gem material from hardness 4 to hardness 9+, and Voodoo Oxide polishes will work on a wide range of gem materials as well – including some of the more exotic ones. I hope the following details will help you select the Voodoo products that best suit your needs. If, after reading this information you still have questions, shoot me a question and I’ll be happy to give my recommendations. Voodoo 1200 / 15-µm carving & concave-cutting paste: This SUPER FAST AND SMOOTH paste, used on a Copper mandrel, will cut almost as fast as a 600 metal-bonded lap, while leaving a very smooth finish, so you can get quickly to polish. I use this paste for both gemstone carving and as the primary grit for concave cutting. Use on Copper, Corian, BATT, etc. Voodoo 2,000 / 9-µm prepolish: This INCREDIBLY FAST prepolish cuts as fast as a 600 (red) Newbond, but leaves an even slicker finish on most materials, requiring very little work with any of the Voodoo polishes to complete a competition-grade finish. This prepolish won’t under-cut on finicky materials like Corundum, Spinel, or YAG. Voodoo 3,000 / 6-µm prepolish: A VERY FAST and FINE prepolish that cuts about half as fast as the 2,000 – still way faster than a 1200 (blue) Nubond lap, and leaves a finish good enough for girdle polishes. It requires so little touching with any of the Voodoo polishes that you can cut the meets “on” with this and the final won’t usually visibly move them. Voodoo 8,000 / 3-µm prepolish: A a special-use ULTRA-FINE prepolish, for carving and concave work; for huge facets; and to work with troublesome materials. Voodoo 14,000 / 1-µm polish: This is my VERY FAST polish that makes it easy to adjust meets, moving them almost as fast as a 1200 Nubond (blue) on many stones. This is the work-horse of Voodoo Diamond polishes, and will leave a very nice finish on most gem materials between hardness 6 and 8. For most polishing tasks, I recommend this one first. Voodoo 50,000 / .5-µm polish: This is a VERY FINE polish, still fast and can move meets around. It can still be used directly after 600 metal-bond cutting on smaller stones, and can still drift meets in easily. This compound will polish most materials hardness 4-6 and 8+ without leaving any haze or drag marks. 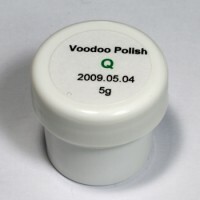 Voodoo 100,000 / .25-µm: This is an ULTRA FINE polish for those stones that require super-fine diamond. This polish is recommended only for faceters experienced withi 100,000 mesh. Voodoo BLACK MAGIC 14,000 / .75-µm polish: This is a very special formula polish using ultra-sharp friable diamond. It cuts and polishes very fast, yet leaves a really premium finish on most gem materials between hardness 6 and 8. I use BLACK MAGIC on finicky stones, or when polishing on cleavage planes of stones like Topaz or Spodumene, or when polishing really large facets on precious materials. Voodoo BLACK MAGIC 50,000 / .375-µm polish: This is a very special formula polish using ultra-sharp friable diamond. It remains fast and can move meets around and will polish most materials hardness 4-6 and 8+ without leaving any haze or drag marks. This BLACK MAGIC was my “secret weapon” polish for several years, available only in very limited quantities and for a very premium price. Due to many requests, I’m making it available as a standard product. Oxide polishes operate in a chemical rather than abrasive fashion to manipulate the surface of the facet. For this reason, they do not induce surface strain associated with ductile manipulation by sub-micron-sized diamond particles. This is especially important in Quartzes, but may also show superior appearance in other materials. Oxide polishes have traditionally been very messy to work with – and challenging for faceters, who almost universally tend to use too much polish and water – resulting in a variety of undesirable results from balling-up of polish and scratching, to drag marks and rounding, to simple failure to polish. There have been a variety of strategies to try to address those issues, including embedding oxide polishes in resin laps. Voodoo Oxide polishes use a special Voodoo base that is used to coat the surface of a lap, holding the polish flexibly in place, preventing it from slinging off, including a lubricant to prevent heat build-up, and allowing just the right amount of water to cling to the lap so the chemical process is properly catalyzed. Use Voodoo Oxide polishes with a very light mist of water applied with a hand pump mister like a hairspray bottle or a perfume atomizer. Mist a nice cloud above the lap and let it settle onto the lap – just enough to feel the friction increase dramatically. Maintain a very light dampness in this way, and experiment to discover the optimal amount. Polishing with Oxides is more complex and challenging than polishing with diamond, but it is an essential skill if you cut Quartz. VOODOO “Q”: This is an older oxide-diamond hybrid polish, originally intended for Quartz, but which proved most effective at polishing Beryls very quickly. VANILLA VOODOO: This is a new oxide-based Voodoo that is used very sparingly on all the same kinds of laps that you usually use Voodoo on. As an oxide, it requires water – in a very light mist – to activate the magic between this polish and the gems. This is the result of years of research and development for a “magic bullet” for polishing Quartz quickly and painlessly. Use at slow speed. VOODOO WET CHROME: This is a special Voodoo base with a rich charge of Chrome Oxide. It offers all the advantages and versatility of Chrome polish, without the usual mess. The Chrome remains trapped in the base and locked to the lap, while you apply a very light mist of water to facilitate the chemical polishing. Voodoo Wet Chrome can be used on a huge variety of materials (including Moissanite), and due to the unique formula, can even be used at high lap speeds. 10 Responses to Which Voodoo Faceting Polishing is Right for You? I facet mostly glass like colored glass, lead crystal, and trophy glass, which Voodoo polish is the best one to use for the sharpest facets and the best polish. I am currently using cerium oxide and spectra disks. You can polish those materials with 50k Voodoo – or Vanilla. Either will work on Matrix laps (which we recommend). Those Spectra disks will really round facets, so you’ll be happy with almost any sort of solid lap, once you get used to using it. I cut mostly CZ with a Facetron using a Darkside lap and Diastick 3000 for prepolish and 50000 for final polish. What voodoo products would you recommend as a alternate. I’ve become very enamored with the Zinc+ prepolishing lap charged with Voodoo 3k pre-polish for very fast removal of cutting damage, and leaving a very slick and polish-ready surface. There are any number of strategies for final polish. So, my final polish recommendation depends on what’s already in your arsenal – and how experienced you are – how much versatility and forgiveness you’re seeking. Personally, my first tool out of the box would be the Diamatrix lap with Voodoo 50k polish. However, CZ can sometimes be a bit finicky. Most people know I used to recommend the Corian lap, but lately I’ve been really studying the versatility and forgiving nature of the Matrix lap – which I’m now referring to as “Corian on steroids”. Unlike Corian, it won’t glaze-up and require de-glazing procedures. And, it will work with both diamond and oxide – You can swap between them with just a quick scrubbing with dish soap and a brush. So, if you already have one of those laps, I’d say put Voodoo 50k on it and you’re likely to be happy. If you’re more experienced and skilled you may like to try the Diamatrix first. If you’re less experienced and looking for more forgiveness and versatility, try the Matrix first. I hope this is helpful. If you have other questions, just shout back. If you want a faster response, feel free to use that contact link above. I would like to have your recommendations on final polish of sapphires. Right now I am using a Voodo0 3,000 prepolish and then I have been using the Voodoo 50,000. Should I then use Voodoo 100,000 to finish the polishing ? Remember that smaller particle size doesn’t always mean smoother polish. Smaller particles can cause ductile manipulation – installing surface strain. And, that can cause tiny cracks that look like scratches or haze. If you experiment, you may find larger particle size produces subjectively “better” polish (less haze) on different materials. Polishing is always an experiment – keep that in mind. The size of the diamond particle seems different from the point of view of the facet, depending on the lap material and lubrication. So, if you’re using a BATT lap, the diamond sinks in, therefore seeming smaller to the facet than diamond particles on a really hard ceramic lap. Think about as you EXPERIMENT. In general, I consider 50k the optimal particle size on a BATT or BA5T lap – and usually on a Diamatrix. But, you may find that 100k will be helpful if you’re on the harder surface, and depending on your rough. I hope this helps. If you have more questions, please ask. And, for a faster response, use the ASK ME link above. I bought the vanilla and chrome polish, but they are not working for me. I work a lot with Topaz and the Chrome just is not working. I am misting the lap and running the lap at high speed. Any ideas? I understand the frustration with polishing. Even now, when I’m frustrated with faceting, I guarantee it has to do with polishing something. And, I hear that from my colleagues as well. There are many factors to polishing technique, including pressure, lap speed, speed of sweep, amount of polish used, etc, etc. AT THE ACADEMY, WE TEACH EIGHT SPECIFIC COMPONENTS OF *TECHNIQUE* ALONE. You didn’t mention the type of lap, which is half of what we call polish-lap “recipe”. I use Voodoo Oxides on both Corian and Darkside laps – and occasionally Wizard lap – with success. Also, “not working” could mean many things – from nothing happening at all, to polishing too slowly to tolerate, to orange peeling, stripping cleavages, polishing unevenly, rounding facets, or leaving scratches. If a polishing system (recipe and technique) is leaving scratches, the nature of the scratches gets into another vast list of possibilities of what that could mean – furrows, streaks, groups of scratches, isolated cat-hairs, etc. I do not think Vanilla will work on Topaz AT ALL. I would not even try it myself. Chrome would not be my first choice for Topaz, because Topaz responds so quickly and so well to diamond. If I had a Topaz that was troublesome with diamond, I may go to Chrome as a work-around, though. The above is intended to get you thinking about the POSSIBLE list of factors involved – and to being experimental with them, varying one component at a time. This is the CRAFT of faceting, btw – experimentation. Even today, with all the polishes I have and use, I’m testing two new polishes in the studio! Usually, the above line of conversation gets a person into an experimental frame of mind enough to find and resolve the issue. If you continue to have frustrations, feel free to e-mail with really SPECIFIC information about the polish-lap recipe you’re using, and the specific aspects of technique that are producing identifiable unique outcomes. From there, I can probably help you troubleshoot the issues. dear John, I have always been using cerium oxide to polish emeralds, do you have any better idea? One of the best strategies for Emerald is the Greenway (and probably Creamway) laps by Gearloose – and sold here on the Academy site. These laps have aggressive oxides embedded in the laps, so they can’t embed polish into the cracks in the gem. This is particularly useful for doing repair work on Emeralds where you don’t know the treatment status. So, I personally would use the Greenwing lap for Emerald repair work.